Life less hurried, living in the slow lane: JICAMA have you tried it! JICAMA have you tried it! Jicama pronounced (HIC-A-ma) Is a very yummy vegetable. It is light and crisp. It has a sweet taste.If I had to describe it; I would say it is like a cross between a raw potato, an apple, and a suagar snap pea. It is a great addition to salads. It makes an interesting change instead of the usual vegetables on a relish tray. You have gotta try this vegetable. Don't be fooled by its simple mundane appearance. It is shaped like a turnip, yet has the tan color of a potato. 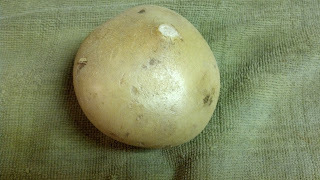 It is often called a Mexican potato or Mexican Turnip. There is greatness inside that brown bulb. They are low in calories, and are high in vitamin C. They have quite a bit of fiber. They are a wonderful addition to the diet. The kids seem to love them. Jicama can be small or they can grow to be very large up to 50 pounds. Avoid bulbs that are twice the size of your fist or larger, they tend to be woody in texture. Choose a smaller size for the most sweetness. 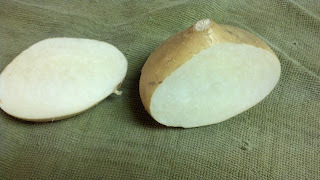 Avoid buying Jicama that has dark brown spots or mold growing on them. Avoid ones bruises or cuts on them. 1. Pick a medium sized bulb with a dry stem that is firm to the touch. 2. Peel off the outer brown skin to reveal the white flesh inside. 3. cut into desired shape. Dice or Julienne for salads. cut into a french fry shape for dipping. It can be grated or finely chopped in salsa etc.Many prefer to eat them raw, but they can be cooked. 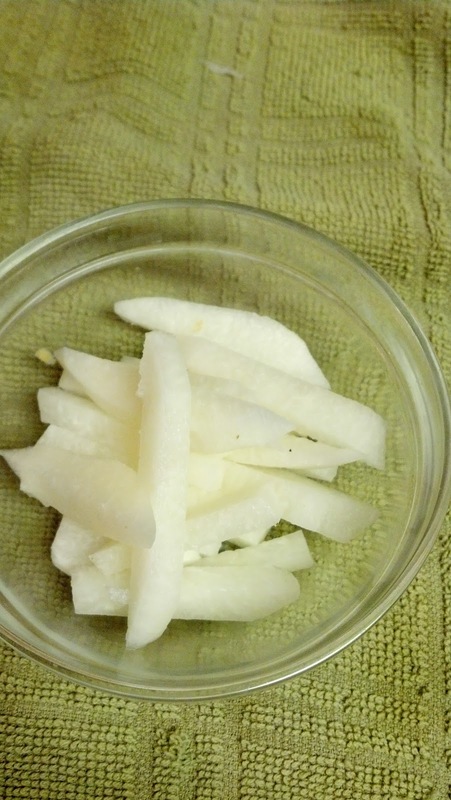 Jicama is used in oriental dishes like a stir fry or spring rolls. When cooked they end up with a texture similar to waterchestnuts. I found a recipe that I am eager to try. Mix salad ingredients in a bowl then toss with the dressing just before serving. Just for fun I have included some links below for more reading about this wonderful vegetable. I hope you will discover a new favorite food in Jicama. I just stopped by from Foodtastic Friday. I'm a new follower and I have pinned the jicama post. I would like to invite you to join the Foodie Friends Friday linky party and giveaway I co-host every Friday. It's a fun party and you can find lots of great recipes and new blogs to share with. This is a great Salad, we just love Jicama, it is a great veggie! Hope you are having a great Valentine Weekend and thank you so much for sharing with Full Plate Thursday. I haven't tried making anything with Jicama...but I've had it at restaurants. Found you on Farm Girl Friday! I would love to have you share this on The Creative HomeAcre Hop today! I love jicamas but haven't eaten them for a long time... Your post has made me want to buy them . Thanks for sharing on Foodie Friends Friday and I hope you will join us again this coming week. We would appreciate it if you would link back your recipes to us. Newest follower now. Thanks for sharing this awesome post. I love jicama but don't buy it as much as I should. I like to grate into salads and slaw or eat it raw and dipped in some hummus. Tap on gamekiller apk data. jimdo.com/ If your gadget states "Installation Refer Blocked", most likely to your tool Game Killer Download APK Free PC, Android, iPhone Easily establishing Applications as well as tick Game Killer the Unknown Source choice. Game Killer App Now Game Killer Will be installed on your tool. If you're interested in the puzl.com/ BOB Ironman for jogging only, you'll locate the Website distinctions are besides the apparent fixed front wheel The Most Effective TOP RATED CONVERTIBLE CAR SEAT WITH REVIEW 2017 a front tire that's inches.